Nothing is what it seems when a woman rushes into the Mt. Thomas police station claiming a man has kidnapped her children. As a custody battle unfolds between the feuding parents, Ben's work eerily starts to mirror his private life. Shattered by the news that his ex-wife plans on taking his kids to Perth, Ben is determined to go to any lengths to keep them in Victoria. Notes: this would appear to be Kat Stewart's first television appearance. Her episodes of The Secret Life of Us, Something in the Air, and Stingers would not air until August and September. Her breakout role in Underbelly doesn't happen until 2008. Rachel Stewart was played by Margaret Mills in episode 6.11. A custody battle gets out of hand when the father of the two children appears in court with a bomb strapped to his body and threatens to blow himself and everyone else in the courtroom. He abducts Ben and flees into the bush. Will the Heelers find them in time and can they set the children free from their irrational father? A famous crime-fiction writer visiting Mt Thomas for research purposes is asking a lot of questions about the death of a baby 25 years ago. When he discovers the body of a missing child, Tess wonders if he is capable of committing the very acts of violence he writes about. 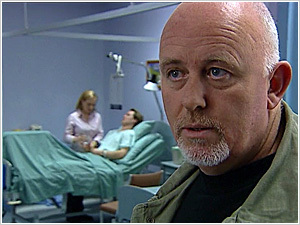 Tom confronts the author, who reveals his intimate connection to the long-closed case of the baby's death. How can Tess and Tom separate fact from fiction? Tess and Tom must choose a new policeman for nearby Widgeree. 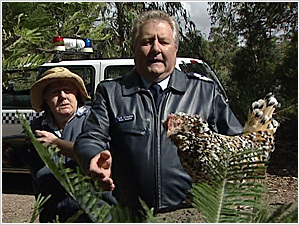 Tom thinks old-fashion policing is the way to go and suggests Senior Constable Ian "Gossie" Goss but Tess disagrees. She picks a different candidate — a modern by-the-book policeman, Simon Barclay. 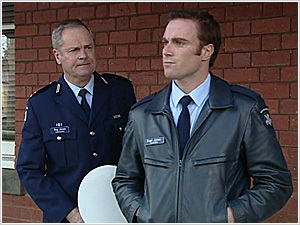 Inspector Falcon-Price backs up Tess, driving a wedge between Tom and Tess, and Senior Constable Barclay gets the job. But Tom is soon proven right as Barclay gets the locals offside from day one. When a brash pair of city detectives arrive in Mt Thomas, PJ is faced with the opportunity to move back to Homicide in the big smoke and have an affair. But a limbless corpse leads to another dilemma — has a spurned lover gone mad with a chainsaw or could it be a brilliant set-up by a criminal mind? Sgt Tess Gallagher takes on more than her job demands when she tries to help the three children of a local woman whom she believes are being abused by the latest de facto. Even when Sen Sgt Tom Croydon tells her there are no grounds for suspecting abuse, a stubborn Tess refuses to drop it. Something from her past, perhaps personal experience, tells her to persevere. When she discovers the three children; Hayley, 10, Darien, 8, and Frasier, 6, have broken into her car and slept there overnight, Tess knows her instincts were right. But she is at a loss with what to do with them. She takes the kids back inside her house, feeds them breakfast and plans to take them to DHS to be placed in a safe house. But the kids get wind of her plans and flee in fear to the nearby mines. Things go from bad to worse as Tess has to confess to Tom what has occurred — the children have disappeared while they were in her care" and their mother Tina doesn't know they are missing. 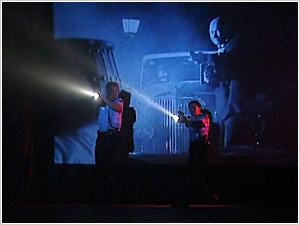 At the old mines, Tess and Jack Lawson find Hayley and Darien but little Frasier has been trapped in collapsing rubble. Ben Stewart and Jo Parrish arrive with mine expert Roy to oversee the rescue operation. In the meantime, Tina has been told her youngest is missing and decides to go looking for him herself but ends up falling down another mine shaft. Burdened with the guilt that it is all her fault, Tess decides to go down the mine in search if Tina. Jack tries to stop her but she pulls rank. The race is on for the SES to find little Frasier and for Tess to find Tina. At the end of the day someone will not make it out alive, leaving everyone in shock. PJ's mother comes to stay and trouble follows after she forces him to go to a "get rich quick" seminar. A car smashes into the venue with the driver claiming the financial adviser is a con man who preys on the elderly. Can PJ keep his professional distance, while allowing his mother to play a vital role in solving a case? Jo is under pressure when her parents arrive in Mt Thomas with one aim — to find their "princess" another career. Meanwhile Jo and Jack are on the case when a valuable vat of red wine is mysteriously unplugged and drained into a creek. Things get worse when Mr Parrish takes on one of the suspects and is consequently charged with assault. Emotions run high between Jo and Tess as Jo's loyalty to family clashes with professional duty. PJ's long-held plans for a raid on an illegal tobacco dealer is blown when a bushwalker goes missing forcing the emergency search to take precedence. A charming hot-air balloonist raises Jack's suspicions when he takes Tess for a ride and is conveniently on hand to aid in the rescue of the missing bushwalker. Meanwhile, the tobacco dealer has got wind of the cancelled raid, and is determined to make someone pay. Jack and Tess follow a hunch on the whereabouts of the illegal tobacco and find themselves in a high-risk situation, leading Tess to admit to her true feelings for Jack — an action she later regrets. A rough-looking man loitering around the local high school turns out to be a convicted cop killer — Mick Boyce — who's just finished doing time. But he just isn't the perving type. So what is he up to? And why is he in Mt Thomas? The situation becomes volatile when Jack decides to make him feel unwelcome. Tess tires of Jack's apologies and begins to doubt him as an objective member of the team. Meanwhile Ben and Jo are looking into several car thefts which appear to be youths joy riding. The investigation leads them to the home of Heath Flemming, a wild and confused teenager who believes his parents are dead and lives with his grandmother. 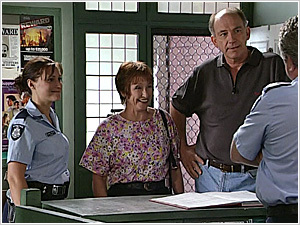 But when the grandmother meets up with Mick Boyce in the Mt Thomas police station, the truth about Heath's lineage is revealed. In a heated exchange with Heath, Jack tells the boy the truth about his father — with tragic results. Tess witnesses a side of Jack she'd rather not have to deal with, and runs out of patience with his headstrong behaviour. Tom's nostalgic support for Mt Thomas' only cinema, "The Bughouse", cannot stop it being demolished, but an unsolved mystery from the past can — at least temporarily. Jo takes on the case, delving back over thirty years, and discovers that old style heroes and villains are alive and well in Mt Thomas. Notes: since Gerard Kennedy's character admires the portrait of Queen Elizabeth II in Tom's officer, this is a good a place as any to provide a link for some info on the famous 'wattle painting'. A rare alternative to the usual end credits with a jazzy version of the BH theme playing along with scenes from the old movie that was seen briefly at the beginning of the episode. Notorious armed robber Arnie Briggs is a local boy and, having just escaped from prison, the last place the Heelers expect him to be is back on his old turf. But Jack suspects otherwise, going maverick in his search for Briggs, and in the process drags Tess into a highly volatile situation. When Tom attends a scene of vandalism at a Vietnam War memorial garden, he discovers the culprit is an escaped, prize-winning bantam pullet called Hannah. When the hen is later found with a broken neck, her frantic owner suspects the neighbour, who is a rival poultry breeder. With several other likely suspects to choose from, Jo seizes the opportunity to escape pressing paperwork, and takes up the case with all the enthusiasm of a comical amateur sleuth. But the situation intensifies when a young homeless boy is rushed to hospital suffering from a deadly virus directly linked to free-roaming birds. With the population of Mt Thomas under threat, the disposal of all local chickens is urgent. An apparently simple case involving a high school student stealing the tires off his principal's car evolves into a more dangerous matter when the boy then steals the car of man wanted in relation to a recent murder. Still reeling from being separated from his family, Ben is on a downhill spiral — hell bent on living for the moment. In the process he becomes entangled with a woman on a similar path — and inadvertently makes a discovery that leads directly to a murder suspect with tragic results. A plane crashes into a farmhouse, killing three people. Ben takes the a case too personally and oversteps the mark in his investigation efforts, causing havoc for the victims' families in the process, and giving Tom more cause to doubt Ben's attitude to the job. Constables Jo Parrish and Jack Lawson answer a call to attend a gang of youths drinking in a park. When the duo arrives, they find two girls involved in an altercation. Jo decides it would be best to let the kids go, but when one of the girls is reported missing the next day, Jo's leniency is called into question. PJ plays cupid in helping Jack form a bond with Tess. Jack is determined something is on the nose when Tess accidentally hits a young man, knocking him unconscious. While Tess puts herself up for scrutiny by the ESD after the man's medical condition becomes life-threatening, Jack sets about proving her innocence, and discovers the real blame might lie with the victim's connections to illegal bare knuckle boxing. Tess and Jack's romance is in full throttle. Jo teases him about his nightly sojourns, but Jack revels in his secret dalliance with the Sergeant. Then they are called out to attend an attack on a convicted drug trafficker and everything begins to change. Five years ago, Brad Eckhardt killed a local high school student with a bad batch of ecstacy. Having served his time, Brad is back in town to nurse his sick mother. With Brad's promise that he's changed his ways, the last thing mother or son want is the past coming back to haunt them. But grief does not forget easily, and the victim's father is determined to make Brad suffer. When a report comes in from a local high school that someone is dealing ecstacy, Jack assumes Brad Eckhardt is dealing again. Once a pusher, always a pusher. Jack goes in hard, using threatening tactics and inciting locals with inflammatory comments about Brad. Then Brad's mother is assaulted outside a supermarket, and Tom — incensed by a town vendetta — lays it on the line. He says it is not their job to be judge and jury — and if Jack wants to accuse Brad, he'd better get some evidence first. Urged on in his vengeful mission by the death of a schoolgirl from a bad dose of ecstacy, Jack becomes desperate to prove Brad is guilty. Tess can only watch in horror as he oversteps the line. Jack finally wears down a student found dealing, and gets the statement he's been waiting for — one that puts the blame firmly on Brad. But his maverick actions lead Jack to a decision that will change his life forever. Following the death of suspected drug manufacturer Bradley Eckhart, Jack's career comes under threat when an investigation uncovers inconsistencies in his version of events when compared to the forensic report. Influenced by her feelings for Jack, Tess risks her own career by providing Jack with confidential information about the investigation. Jack's unrelenting belief in Eckhart's guilt is put to the test when his innocence is eventually revealed. Tess' preoccupation with Jack's murder charge has to take a back seat when a young boy goes missing. His parents recently won the lottery and kidnapping is suspected. PJ and Tess question the boy's uncle and the uncle's mate to no avail. PJ becomes suspicious when a video tape is delivered with a recording of the boy reciting the ransom demand. The amount demanded is exactly half of what was won by the boy's parents. PJ believes the boy knows his kidnappers. On the trail of the missing boy, Tess is held captive in an airless trucking container. Will the Heelers find Tess in time? Elsewhere, Jack faces a minimum of five years in prison after pleading guilty to manslaughter. PJ and Jo stumble upon a young naked man wandering the highway. Confused, hungry and bruised, he is a stranger to the town and appears unable to understand English. PJ and Jo organise a translator and discover he is a Kosovo refugee who escaped from a detention centre while awaiting deportation. PJ investigates the mysterious death of a man from St. Davids and discovers a connection to the escaped refugee. When PJ seeks to question the young refugee, he finds himself impeded by a band of determined locals. Are they hiding the young man from the police? The runaway is incriminated further when the Department of Immigration send a representative to Mt Thomas. The young man is accused of black marketeering and murder in his homeland. PJ is incensed when Jo accuses him of being prejudiced against refugees. PJ is adamant that it's the law and not how he feels that is important. He is briefly vindicated in his assumptions when an old man believed to be harbouring the refugee is found knocked unconscious. Immigration are impatient for results and order the Heelers to search the Imperial. Chris is defiantly unhelpful: he has suffered enough. When PJ finds the young man and hears first hand the horror he has endured, he must make a choice. Does he follow the letter of the law or the voice in his heart? Tess narrowly escapes being knocked down by a speeding car the same day the new probationary constable, Evan "Jonesy" Jones, arrives in town. Jonesy is rebellious and charismatic and under Tess' skin from the moment he arrives. They couldn't be more different, but together they investigate a young drag racing gang. Tess is determined to put a stop to it before someone gets hurt. Tess and Jonesy discover a link between members of the gang and a separate case involving stolen car engines. Jonesy is concerned when a lead suspect threatens to get revenge on Tess, but Tess is dismissive. Jonesy fights to rescue Tess when her life is endangered. Will he get there in time and will Tess be able to accept his help? Notes: Ditch Davey makes his debut as Constable Evan Jones, he is added to the opening credits in the next episode. Future regular Samantha Tolj (11.24 to finale) makes her second guest appearance (7.23) as Loelle Nixon. Jonesy's preconceptions about the sanctity of parenthood are challenged when he befriends a young mother in trouble. Jonesy and Tess discover an abandoned newborn baby their investigations lead to a local schoolgirl who is in denial and swears there is no baby. Jonesy earns her trust and she confides in him that she was raped. When questioning reveals one suspect's violent tendencies, Jonesy convinces the young girl to make a statement and also urges her to reconsider giving up the baby. What do an alleged Peeping Tom, a trip wire in the National Park, a break and enter, and a bashed truck driver have in common? Like it or not, Jo and Inspector Falcon-Price are about to find out. Jo is mortified when Falcon-Price decides to partner her for a day of active duty, but what can she do? Jo feels responsible when Falcon-Price is abducted while they are investigating a series of mysterious disturbances. Can she find him before he is hurt? Can they manage to work together long enough to save each other's life? Tom is caught between a rock and a hard place when two old friends and colleagues are suspected of stealing a large marijuana crop. One is a rule breaker, the other has always played by the book. Tom disobeys orders when he is told to step back from the case. Determined to uncover the truth, Tom embarks on an investigation of his own. The truth, discovered, is not easy to take. Clearing one friend will ruin the other. Can Tom prove what he knows? And is he prepared to? Ben is shocked when he discovers a group of young girls practicing witchcraft under the guidance of an older man. Are they in danger? Ben battles to keep his protective instincts in check as his investigations reveal more than he was prepared for. Can he save the girls, or are they already deep under the man's spell? Jo discovers a well-respected local politician dead in his car on the outskirts of town. The autopsy not only reveals that he was moved after death but that had ecstasy in his system. Why would a man with a heart condition knowingly take such a dangerous drug? Did someone deliberately feed it to him knowing what it could do? So many people had a motive… was it the girlfriend, the illegitimate child, the politician's wife, or his ambitious son? Can Jo unearth the truth before any more damage is done? Is Jonesy prepared to risk everything in his quest to avenge the death of his father? When an investigation into DDT poisoning leads to Les Anderson, the building contractor Jonesy believes responsible for murdering his father, he appears to exploit Jo's sympathy and pushes in hard. Anderson pushes back. Jonesy's adoptive father, the respected Commander Reg Jones, stops the investigation. Jonesy knows it's a coverup but is he willing to bring down the Commander to prove it? 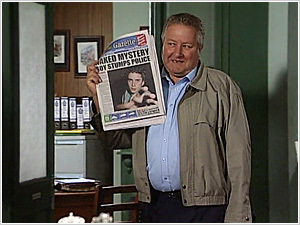 Jonesy discovers a coverup as he fights to reveal Les Anderson as the murderer of his natural father. His adoptive father, Commander Reg Jones, withheld information from the inquest into the death. Why? Was he trying to protect Jonesy or did he conspire with Les Anderson to cover up a murder? As Jonesy fights to discover the truth, the Commander's reputation is placed against the wall. Have his protective instincts allowed a murderer to walk free? Can Jonesy stop another man's life from being ruined at the hands of Les Anderson? Jo begins to believe her own publicity when Inspector Falcon-Price pushes her into a police Public Relations campaign. A man is caught speeding and discovered with an unlicensed gun. 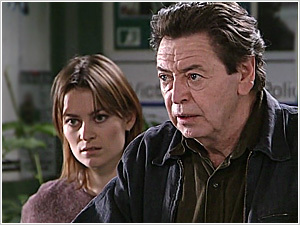 When he is implicated in an armed robbery, Jo is quick to assume his guilt but PJ criticises her reasoning. Is her newfound celebrity undermining her ability to do her job? When a second armed robbery is committed while the accused is in remand, Jo's certainty is shaken. Was the man protecting somebody? Can she and PJ prove it or has Jo's vanity irrevocably compromised the case? Ben and Jonesy's essential differences complicate their search for a young child responsible for throwing rocks at passing cars. They disagree when their investigation leads them to an assaulted teenage boy who refuses to name his attacker. Ben and Jonesy discover that the stone-throwing child is the stepbrother of the assault victim and is medicated for A.D.D. Family complications are exposed when his medication is stolen. Who is responsible? Ben and Jonesy realise that they are both searching for the same solution from opposite points of view. Tess and Jonesy investigate a domestic disturbance and Tess is reacquainted with Hayley Fulton, a troubled young girl from her past. An unpopular neighbour's portrait is discovered riddled with bullet holes and he is adamant that Hayley is responsible but Tess defends her. An elderly woman's dog is found shot dead and PJ discovers that the bullets from both crimes match. When the weapon is found, Hayley is implicated. Tess' faith in Hayley's innocence leads them to the truth but places Hayley's future in jeopardy. Will Tess challenge the stability of her own world for the sake of Hayley's? Notes: guest star Jeff Truman will go on to write two episodes in series 12. Cherise Donovan plays her fourth role dating back to series 1. Julia Blake's only BH appearance. Tom tries to keep his mind on the job after becoming interested in a mysterious woman. When two houses are broken into and large sums of money are left on both kitchen tables, the Heelers are left wondering. Were they gifts or proceeds from a robbery? They find the man responsible and he claims he is seeking atonement by doing God's work. He says he is honest but PJ suspects he's been guilty of fraud. The man's request for spiritual advice leads Tom to a surprise — the new Anglican Minister is Tom's mystery woman. The man with the mission disappears and his car is set on fire. Was it an act of revenge or a desperate act by someone close to him? Can Tom and the Reverend help him before his determined acts of generosity cost him his life and the happiness of his family? Jonesy's lack of experience complicates an investigation when he lets a man go after breaking up a fight at the Imperial only to later discover the man is wanted for drug trafficking and burglary. Is he the same man recently seen troubling the local bank manager and his family? Jonesy's concern for the family and his desire to redeem himself places him on the back foot with Tess. His concerns seem justified when the bank is robbed and the bank manager and his family are discovered missing. Would he rob his own bank… and who else is involved? Jonesy is determined to find out. Can Tess convince him to play by the rules or will Jonesy's good intentions place the bank manager's family at even greater risk? What do you do when lives are in danger and you have only seconds to make a decision? Tess is off duty when she and Hayley, a twelve-year-old girl she is hoping to foster, discover a serious car accident on the edge of town. The female driver is trapped and the car catches fire. Is there enough time to extinguish the fire and get away safely? Tess decides there isn't and the woman is killed when the car explodes. Her husband blames Tess and she comes under the scrutiny of the Ethical Standards Department and even begins to doubt her decision. Was she responsible for the death of the woman? Tess' application to foster Hayley is threatened. Is she capable of keeping Hayley safe from harm? Jo and Jonesy question the victim's family and fight to clear Tess' name. Even if Tess' decision was justified, has her chance to foster Hayley been lost? Things are going much better now for Tess and Hayley, until an incident at school provides Tess with something to worry about while Tom and Reverend Grace grow closer. Meanwhile, Tom suspects a retired thief guilty of burglary until he is questioned and the old man claims he was set up. The Heelers have a lead on another suspect and their hunt leads them to two teenage boys. One is the estranged son of the retired thief. Is he following in his father's footsteps? When a second robbery occurs involving a serious assault, the old man defends his son's innocence. He might not be the world's greatest father, but he's positive his son is not violent. When the Heelers locate their original suspect they discover has a watertight alibi. Does he have a hold over the retired thief's son? Tom worries for the old man's safety when he is discovered assaulted and his son cannot be found. Can the desire to protect and impress go too far? 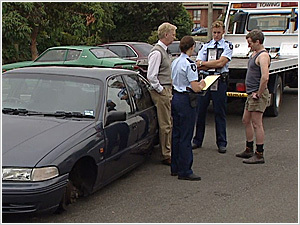 The Heelers suspect a local horse trainer of assaulting and robbing a bookie. Jo becomes intrigued when she discovers a page torn from a diary after questioning the trainer's strapper, stable hand and assistant jockey. The writing is troubled and Jo is concerned that it is a cry for help. Jo discovers the diary belongs to the young stable hand. Has someone been hurting him and why won't he say? When the trainer is found bashed and the stable hand is missing, Jo worries he has finally fought back. The trainer dies and the stable hand is convinced he is responsible. Jo is determined to prove his innocence. Were the bookie and the trainer assaulted by the same person? Can Jo help the young stable hand find the strength to speak out? Tom is dragged to see a touring faith healer but his scepticism turns to concern when the healer is attacked by a man accusing him of killing his wife. Is the healer a fraud? Jo questions him and is surprised to find that he is far from shrewd. His manager, once healed by him herself, is incredibly protective of him and takes care of the business with the help of a roadie. The manager is beside herself when Jo finds the healer violently assaulted. Is this the revenge of the grieving man? Did he and the roadie engineer this together? As Jo witnesses the darker side of faith she marvels at the healer's capacity for forgiveness. Jonesy's failure to follow instructions has him on the back foot with Tess and leads her to conceal the fact that Les Anderson, the man Jonesy believes murdered his father, may be implicated in a death at a building site. Murder is suspected when the building's scaffolding is discovered tampered with. Did the victim's mate and his widow conspire to kill him? The victim's widow further implicates Anderson, but questions arise in regard to her integrity when his alibi proves watertight. Is the widow trying to protect her husband's best mate? 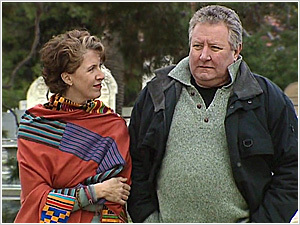 Or did Jonesy pressure her to lie about Anderson? Jonesy's dogged determination to clear the widow's name leads him to the truth, but has he further damaged Tess' trust in him in the process? 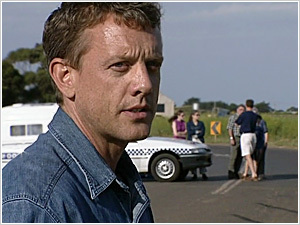 Jonesy must be eliminated as a suspect when Les Anderson, the man Jonesy suspects murdered his father, is found seriously assaulted. Jonesy's ability to remain impartial is doubted. He and another suspect are bonded by their desire to bring Anderson to justice and together they save each other from exacting revenge. 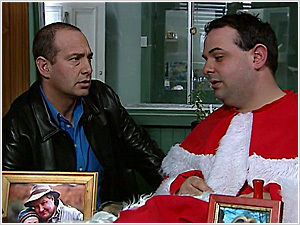 Tom threatens Jonesy with disciplinary action when Jonesy withholds information from the case. As the net closes in on Anderson's assailant, Jonesy learns the truth about his father's murder. Does Jonesy have a future in the Force now that the quest that has driven him is drawing to a close? Ben is desperate to spend Christmas with his children provided he wins the lottery in order to pay their airfare. Tom wins the church raffle but the prize is stolen. The cast of Grace's nativity pageant are suspects. Tom is far from impressed when the sponsor of the pageant forces Clancy, an intellectually disabled man, out of the lead role so his own son can take it. Everyone is thrilled when Clancy is revealed as the owner of the winning lottery ticket, but the pageant sponsor accuses him of theft. As the truth is pieced together, Ben revaluates the demands he has placed on his children. Is Ben's dogged pursuit of the perfect Christmas risking the happiness of those he loves? Peace on earth and goodwill to men? For a cop, Christmas can be the hardest time of the year. Jo can't wait to eat, drink and be merry with her family and friends in Frankston. Tess is determined to give Hayley her Best Christmas Ever, the perfect day she always dreamed of — but never had. And Tom is looking forward to Christmas lunch with Grace — and meeting her eldest son Daniel. But not everyone is happy. Hayley has a troubling secret and won't confide in Tess. And for PJ, Christmas is just another reminder of his loss of Maggie. Ben is pining for his kids who have gone to Aspen with their mother and stepfather. Then Jo gets roped into traffic duties — breathalysing drivers on Christmas Eve with Ben. PJ welcomes the chance to stake out a fugitive, whom they believe is coming home to Mt Thomas for Christmas. When a road traffic accident ends in tragedy, Jonesy must inform the mother that her child is dead. On Christmas Day, Jo drops off her presents for the other Heelers — and is roped into helping PJ on his stakeout. Tess grows concerned at Hayley's lack of enthusiasm for Christmas. Can the day get any worse? Tom's Christmas lunch with Grace is a disaster when her teenage son Daniel is deliberately rude and obnoxious. When he storms off, Tom goes to make the peace — only to discover him smoking a joint in the men's toilets. Tom gives Daniel the choice of confessing to his mother — or Tom will spill the beans. Sadly for Tom, the confrontation seems to have dashed any hopes of a relationship with Grace. Only Tess remains worried. Hayley has something to tell her, but is Tess ready to hear it?